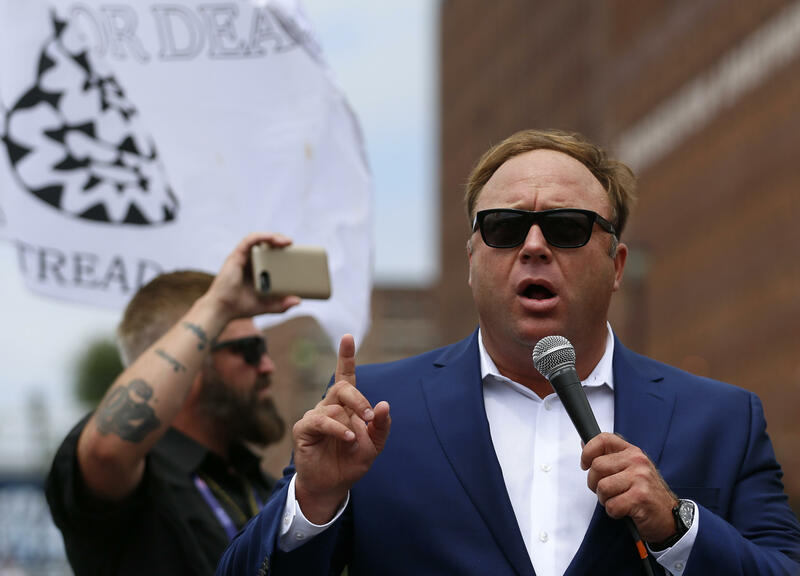 AUSTIN, Texas — Conspiracy theorist Alex Jones wants a Texas judge to dismiss a defamation lawsuit filed against him by families of some of the children killed in the 2012 mass shooting at Sandy Hook Elementary School. A hearing Wednesday in Austin is the first of two this week involving the Infowars host. Jones was sued after repeatedly claiming on his Austin-based show that the Connecticut shooting was a hoax. The shooting killed 20 children and six adults, and it left a lasting mark on the way America thinks about school safety. It helped usher in an era of "active shooter drills" and difficult conversations about safety for even the youngest kids. Jones now admits the shooting occurred, but says his claims were free speech. A similar lawsuit was filed in Connecticut. He's also being sued by a man falsely identified on the Infowars website as the gunman who killed 17 people at a Florida high school in February. Jones' profile has spread from the far-right fringe in recent years. While running for president in 2015, Donald Trump told Jones his reputation was "amazing." Recently, Jones made a baseless claim that Democrats would launch a civil war on July 4. That inspired a viral #SecondCivilWarLetters social media movement of users mocking the idea.